Well, the N900 I had on trial has since gone back to WOMWorld, and it’s time for a summary blog post. No look at a gadget would be complete without boiling the good and bad of it into an arbitrary number of points (and there’s already a few lists out there from Starry Hope and Prodigal Fool (who did two) amongst others), so here we go – 10 things I love about the N900 and 10 things I hate about it. But I also wanted to compare it to its most obvious competitor, the iPhone, and frankly the iPhone gets its backside kicked in the comparison, so you can also read the two fundamental reasons why the N900 is better than the iPhone ﻿and will remain so. It does everything. Up to now, I’ve carried the E71 as a phone, a cheap digital camera for a camera and my laptop to read emails and watch podcasts and video online. With the N900, on two seperate field trips, I didn’t need any of them, the N900 was more than good enough to do everything I needed. But this point is more than just the fact that the sensors and hardware on the N900 are so good, it’s also about software and design – the N900 is about the best example I’ve seen yet, on any device, of convergence. Open up the conversations app and it’s not just SMS messages you’re looking at, but messages from almost every other IM platform as well, all woven into one single tapestry. Voice communications are handled the same way – VoIP and ordinary telephone calls get handled by the Phone application natively and directly. 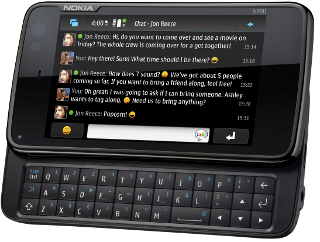 This isn’t just an interesting software tweak; this is a unifying design principle, and it means that the Nokia N900 really isn’t a telephone — it’s the first real communications device. And on this metric, it blows the iPhone right out of the water. The iPhone doesn’t even come close to doing what the N900 does here. More on this later. You can program for it easily. Yes, with the E71 you can program for Symbian. With the iPhone or Android, you can write apps as well; but no platform out there gives you as much freedom and as much support and the ease of programming you get with the N900 and Python & PyMaemo. Yes, programming for the phone is an activity that only an incredibly small minority of consumers will ever do; but the fact is, the number of apps available for a phone is a major marketing point, so every little bit the manufacturers can do to make development of an app easier and better, will directly affect their profit figures every quarter. So it’s both nice to see Python on the N900 and sensible to see it there as well. Storage space. 32Gb internal plus a microSD card. That’s enough to carry around multimedia files, documents and more. I can drop podcasts galore onto it without worrying that I don’t have enough memory for storing contacts or SMS messages. More, I can carry a few microSD cards and swap them if I so wish, so in effect, there’s an absolutely massive amount of storage space available to me on the N900 (though granted, carrying several cards, even if they are tiny, is awkward — and having to take off the back of the phone to swap them is even more so). Linux. Look, Apple might introduce proper multitasking eventually (I don’t care what they call that ‘feature’ in the latest iPhone SDK, but it is not multitasking and the fact that people are accepting it being called that says very bad things about the state of computer science degrees in the US and elsewhere — and I say they ‘might’ introduce it because I remember MacOS prior to OSX, and anyone who’d ship an OS that couldn’t do proper memory management might well never introduce multitasking even when everyone else has had it since the 1970s). Android has multitasking now, and so does the N900, and once you have it, you won’t want to give it up (and why should you?). But more than that, linux is a familiar development and working environment, with widespread support — and if you can have it on your communications device as well as your desktop, why on earth would you want it any other way? Industry standard connectors. Seriously, we have electrical standards for a reason. The fact that it’s taken this long to get phones using a proper size headphones socket (and USB and all the rest) is a bit shocking; but at least they’re finally being used. On-board hardware. GPS, FM receiver, FM transmitter, accelerometer, touchscreen, forward and rearward facing cameras, physical keyboard – the number of sensors and input devices on the N900 is excellent and pretty much comprehensive. If there’s a sensor out there that the N900 doesn’t have, it’s not a terribly important one at the moment. And that gives the platform an enormous flexibility when combined with the ease with which it can be developed for. Again, this is convergence as a design theme coming to the fore (this time in hardware) – the N900 really is aimed at being the one box you can carry to replace every other electronic gizmo you carry at the moment. The camera. Granted, this is sortof covered by the point above, but the camera really is so outstanding that it deserves to be a point of its own. Once, a decent camera wasn’t part of the list of things I wanted or needed in a phone; but I’ve since found it can be invaluable for work because it lets me archive whiteboard sessions. And the N900 camera is the best I have ever come across in a phone. Maybe the N8 has more megapixels, but that doesn’t matter. Megapixels aren’t really a good indicator of image quality; and while all the happy reviews of its camera indicate that the N8 is a decent design, I would guess you would never tell the difference between the N900 and the N8 cameras for the kind of photos most people will take with them. And the N900 is as good as, if not better than, the dedicated digital camera I was carrying about with me. I don’t know what else you can say about a phone camera when it gets to be that good. Nokia’s web browser. Forget the iPhone’s browser, forget the symbian browser, in fact forget all the mobile browsers out there at the moment. The N900’s browser is (and is accepted as) the single best mobile web browsing experience available on the market at the moment, bar none. Given that much of what we do in our day-to-day work is done on the web (from the ubiquitous gmail to the more esoteric web apps), that’s of vital importance to anything trying to be a mobile communications device, and Nokia has delivered on this very well indeed. Price. It’s better value for money than anything else in its class. Yes, it costs around €500 and you can pick up an iPhone 3GS for far less on the high street; but not without a contract attached, which means your TCO (Total Cost of Ownership) runs far higher than that of the N900. Compare the prices for unlocked, SIM-free new smartphones against the N900 and the real story emerges. A SIM-free Nokia N900 goes for €542 (including VAT). From the same supplier, a SIM-free iPhone 3GS goes for €709, a SIM-free Nokia N97 goes for €459, a Palm Treo goes for €495, and a HTC Desire for €479 (that’s iPhone, Symbian, WebOS and Android for those curious about the choices). So the N900 is far more reasonable when comparing like for like amongst its peers (and the subsidised price of €290 from Vodafone shows that too). And with what it can do, it’s very good value for money. In fact, given that the N900 is a practical replacement for a netbook, it’s worth considering that €542 is towards the lower end of the price range for netbooks at the moment. (BTW, for our US readers, yes, your prices are much lower; but (a) the same points apply, and (b) by the time you buy the product in the US, ship it to Ireland, pay the various taxes and duties and customs charges and buy the european power supplies and whatever; well, it’s six of one and a half-dozen of the other). Bug 6063. I love the N900, I think it’s a groundbreaking piece of design that beats the iPhone as a device – but bug 6063 kills it stone dead at a single stroke. Everything else about the N900 could be even more perfect than it is, Nokia could give them away for free to anyone who wanted one, and 6063 would still kill it dead. Bug 6063 manifests as total silence when you answer or make a call. You can’t hear anything, the person on the other end of the line can’t hear anything, and there’s no error message or hint that something’s wrong with the phone rather than the line. I actually tried calling someone several times before finding that it was the phone that was the problem, and that’s appallingly unacceptable. Equally, I lost several calls while fiddling about trying to find the hands-free headset and plug it into the phone and answer in time. That’s utterly unacceptable as well. Look, the N900 means I don’t have to carry several other tools. No need for a camera, a netbook, an FM radio, an MP3/4 player, etc, etc. It’s a great communications tool. But if I have to have a hands-free kit to use it as a phone, then, well, it fails. Completely and utterly, without hope of redemption. If this bug isn’t at the top of the Nokia tech team’s priority list right now, I’d be deeply worried. No physical shortcut keys. On the E71, you have four physical shortcut keys which let you launch a few apps with a physical button, and one of those will take you to the home screen (or desktop, if you want to call it that); and with the iPhone there’s just the one button, and it drops you back to the home screen. That’s an important UI design point on a handheld device, where the amount of time it takes to tick off the end user is a lot less than on a desktop platform, and where the time it takes to launch an app can be critical. The different requirements for mobile and desktop users from a UI perspective are reasonably well known; but maybe not well known enough. Still, given the flexibility of the platform, it should be possible to jury-rig something in software. The power button menu, perhaps – there’s already an app that alters the menu that brings up. The touchscreen. There’s been a fair bit of comment on the choice of a resistive instead of a capacitive touchscreen for the N900; and most of it seems to be accurate enough, unlike my (admittedly fat) fingers when using it. It does give a distinctly clunky feel to the device when you press an onscreen button, and nothing happens (especially so when you hear the click sound effect and feel the vibrate, which is a lovely feedback technique, but is let down horribly when the fingerpress isn’t actually accepted by the application). It works really well with the stylus, but the stylus is a rather double-edged sword (if you’ll ignore the really confusing mental image that conjures up). Using the stylus does give pixel-perfect accuracy; but it also means you’re using a stylus instead of your fingers, which slows things down, makes them feel clunky, and takes me personally right back to the Psion Series V. In this area, the iPhone has the N900 soundly trounced I’m afraid, but perhaps firmware upgrades can work a miracle here. Marketing. Yes, it’s cheaper than anything that does as much as it does (if such a device existed, which I doubt it does). Yes, it does more than anything else out there. Yes, as an example of convergence in a mobile device, it kicks the iPhone from here to the wall (and in design, the iPhone’s strongest area). But no-one seems to have heard about it, and getting one is rather difficult and seems more expensive than getting any of its peers. If you want an N900 or own one, you’re probably a geek and therefore in a minority. Will the N900 be the new flagship for the business market, the demographic that could appreciate the communications convergence better than any other? I don’t see the marketing push to get that to happen. There’s a growing concern that the move from Maemo to Meego will leave the device effectively abandoned by Nokia – so why isn’t there a far stronger push than this one to counter that rumour and let everyone know that the N900 will be running Meego via an upcoming firmware release? Why, in short, aren’t we seeing the N900 pushed on every advertising channel out there? This is the best phone Nokia have on the market right now, the most innovative, and the only phone I can think of from any manufacturer that fundamentally kicks the iPhone’s backside; so why don’t I see this thing on offer from every mobile operator and in adverts from every billboard? Without that kind of push, without that kind of market, the N900’s long-term future isn’t as sound as it could be. Time. This is both a cause and an effect — the N900 is newer than the iPhone platform and therefore there are fewer apps written for it at the moment (a few hundred versus tens of thousands for the iPhone/iTouch/iPad). It’s not as widely known, it’s not as widely available and it’s fighting an uphill battle to get recognised in this particular market segment. And because it was late to market, it’s got a big fight on its hands, despite having the goods. And because of that cause, the effect is a question of time – namely, if it doesn’t do well in the market, how long will it be supported for? It’s the best device out there right now for what it does; if it suddenly becomes a Palm Pre with questions over support and longevity, that’s not good for its adopters. Lack of polish. Maybe it’s another effect of time, but the N900 just doesn’t feel polished. Yes, you can get it to do amazing things; but out of the box, it doesn’t do them. There are quirks. The PC Suite didn’t initally work with it (I’ve seen reports that that’s since been fixed). The gesture recognition, especially for the kinematic scrolling, wasn’t as flawless as it could have been. When your competitor for this market is Apple, you really can’t afford to skimp on the polish; and when you’re doing a better technical job than Apple, it’s a crying shame to skimp on it. It feels reactive, not proactive. Mostly, you see this with applications like Witter and others; but you do get the distinct impression, using the N900 day-to-day, that it does things when you poke it; and that’s not always what you want. For example, when using a Twitter client like Witter, I want it going off to twitter in the background and constantly updating and keeping track of things. Likewise with Gmail clients and other communications programmes. When it doesn’t do that, when it takes a user action to initiate such a check for new messages, it’s a design error. I get the reason for not checking gmail every five minutes automatically, but frankly there’s no point in saving battery life if you’re not going to use it to do what I want you to! Happily, this is a software issue only, and can be tweaked fairly easily. It’s only available in black. What? I needed ten points and there just isn’t that much that’s bad about it! Previous Post: Can the Nokia N900 replace a netbook? Great review, or at least, one that I agree wholeheartedly with! I own a N900 and at times I regret it. I’m also an n900 user and couldn’t agree more with the positive remarks you make about the n900. Its an absolutely stupendous device (is that enough marketing hype for you :). The Treo is not a WebOS device. WebOS is only used on the Pre and Pixi (though rumours have it the HP Slate will now be called Hurricane and use WebOS also). The Treos are all either PalmOS or Windows Mobile, the Treo Pro you linked to is a Windows Mobile phone. Whoops, my bad. And that supplier doesn’t have a Palm Pre or Pixi price up yet. From what I’ve seen of prices in Dublin though, it would be in the same price range as those few phones. Yes,using N900 is best for browsing purposes.I ve heard that Nokia is best for its communication but in n900 it lacks a lot even i faced the problem as stated above there was no voice on both sides i thought its a network problem but only i came to knew that this is n900 prob,even if it s a internet tablet it s not upto the mark they have loaded all features but not completely.. I am unable to use it as either smartphone or internet tablet,There are not many options even in browsing i cant switch between window browsers easily. In physical keyboard,we have four arrow keys i dont know for what purposes they are present,closing physical keyboard we cant select,cut,copy,paste texts,also we cant search contacts, even if i have a single point of network i am unable to make a call ..Ovi maps are another biggest bug.. I have to wait ,wait, wait ,,that is it and then nothing the map does.They have certainly given all features and but incomplete. I am wondering how such big organizations leave such simple bugs unfixed. Hoping for the firmware update where these bugs gets fixed. Candid, straight to the point and well writtern, no sentiments. #2 correct the few anomally, I tell you once they have it re-imagined this way, there’d be enough Mavens out there to spread the word out there. Good wite uo. Love this to pieces.